Read the book title with your child. Have him guess what a pancake race might be. 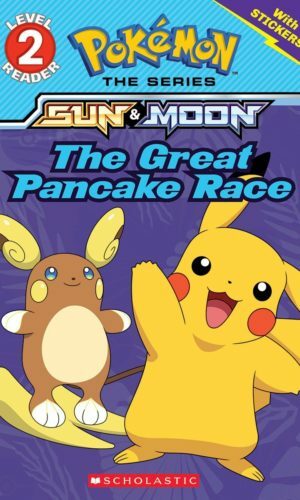 Mallow says the Pokémon pancake race is an island tradition. What are some of your favorite traditions? What is the prize for winning the pancake race? Is that a prize you’d like? How did the different abilities of the Pokémon help or hurt their chances of winning the race? Who would you most like to have as a race partner? Why? How did Team Rocket try to cheat? Who caught them? Who won the race? Was it who you thought would win? Character names can be tough for beginning readers, and that’s especially true with tricky Pokémon names. Have your child try sounding them out using what she knows about letter sounds. Of course, fans of the series might be able to teach you Pokémon names.